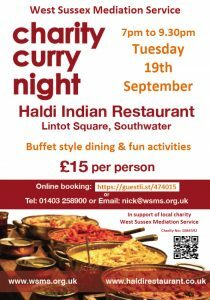 We are pleased to announce another Charity Curry Night. Due to popular demand we are return guests at The Haldi Indian Restaurant in Lintot Square, Southwater, RH13 9LA. It will take place on Tuesday 19th September 2017 from 7.00pm to 9.30pm. There will be a buffet style, all you can eat, meal with various courses available and vegetarian option. There will a cash bar. This is a family friendly event and last year we had several families with children attending. Feel free to come as a group of friends, family, neighbours or work colleagues. We hope to fill the restaurant and have exclusive rights to the space (apart from takeaway walk ins). Please spread the word for us. We will be laying on a few fun activities, that will not disrupt your enjoyment of the food, to help fundraise. There will be some good rewards for the ‘winners’. Tickets are £15 per head. If you require any more information, do get in touch. We are very grateful to Mr Zaman and his staff for supporting this event. The Haldi is an authentic Indian restaurant, serving the finest Asian cuisine. West Sussex Mediation News Copyright © 2019.